All birthdays are special, but Sweet 16 is really special. This party might be formal or it might be casual. It might have a 100 guests or 8 guests but it has to be special. We have 100's of Sweet 16 party ideas to make the day amazing. Pull it all together with a great theme! The other option is a more traditional birthday theme party. We have a great collection of theme parties in our adult birthday section. Once you have your theme, pick a fun invitation. 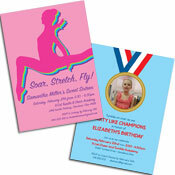 You can buy invitations that match your theme or personalize your sweet 16 invitation. Another option is to pick up one at a local store or make your own! We offer specific suggestions in each theme. 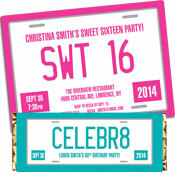 We think sweet 16 birthday decorations should be (sorry I can’t help myself) sweet! We offer suggestions for unique decorations and sweet 16 party supplies in each theme. We have put together a birthday party planning checklist to help with your planning. All guests should go home with a remembrance of the celebration. Sweet 16 party favors should feature the guest of honor. You can make it simple and go with a wrapped candy bar.. Or take the time to frame a picture or create a photo album. 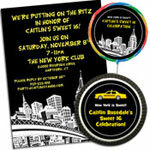 We make specific suggestions for party favors with each Sweet Sixteen party theme. A sweet 16 party for your son or daughter is a big event with plenty of planning required. Need help with your party? We are professional event planners who can help you with sweet 16 party ideas, etiquette, custom products, and anything else you need. Just ask the Party Girl!